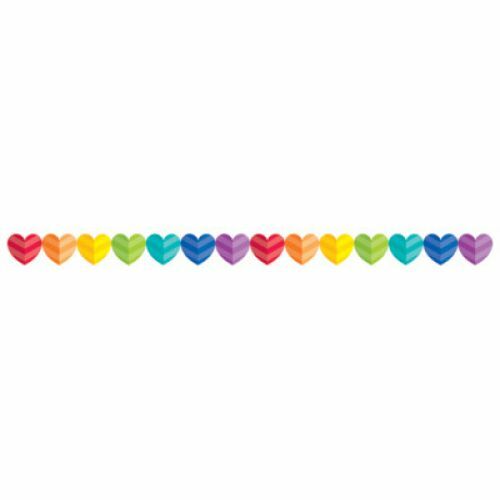 This rainbow heart border is a perfect accent on bulletin boards and Valentine-themed displays! Bright colored chevron hearts make it a perfect border for holiday decorating, a friendship bulletin board, and more! 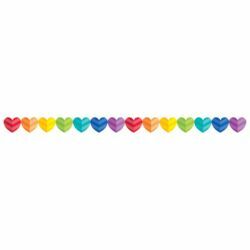 You'll love these rainbow hearts on bulletin boards all year round to promote happiness and friendship! Add style to any bulletin board by mixing and matching our solid and patterned borders. Plus, layering a patterned border over a solid border helps define bulletin boards and provides an extra pop to what is highlighted on the board. Borders are not just for bulletin boards, use these as edgers and trimmers to add style and organization to your designer classroom. For more ideas visit our creative galleries.